IWC Spitfire 3777 S/s 42mm Chronography Xtra Straps. A watch is a classic gift that lasts a lifetime. Whether for a birthday, graduation, or retirement, a quality watch makes a valuable gift to mark an important event. 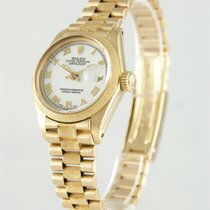 Gold watches, vintage watches, or unique wooden watches all make excellent gifts. Which watch should I gift? When purchasing a watch to give as a gift, you should keep the recipient's hobbies and needs in mind. It doesn't make a good present if the giver likes the watch, but the receiver just leaves it lying unworn in a drawer. Of course, your budget also plays a deciding role when choosing which watch to purchase. A conservative, expensive gold watch as a graduation gift for a high school senior who loves coding probably wouldn't be the best choice. Someone who isn't into technology, on the other hand, and prefers simpler watches, wouldn't enjoy the wide variety of functions available on a modern smartwatch. The gift must suit the recipient. There are some watches with which you can't really go wrong, such as the Rolex Explorer. It has remained somewhat in the shadows of the famous diving watch Submariner, but it deserves a spotlight all its own. At around 5,500 euros for a new version, it's more affordable than the Submariner. Its design is a mix of sporty and elegant. This stainless steel watch is the perfect choice for a meaningful gift. With a black dial, three central hands, no date display, and no complications, it's an incredibly simple timepiece. It was used in the 1953 expedition to climb Mount Everest. In the novel On Her Majesty's Secret Service, James Bond also wore an Explorer, which was inspired by author Ian Fleming's own personal Explorer. The Rolex timepiece is waterproof to 100 m (10 bar). If you want to give the older, smaller 36-mm version as a gift, then you should look for the reference numbers 6610, 1016, 14270, and 114270. Newer versions with reference number 214270 have a diameter of 39 mm. Although it may sound like a paradox, an Explorer is truly a timeless gift. The same could be said of Junghans's Max Bill Chronoscope. It has a modest look inspired by the Bauhaus style (designer Max Bill was a Bauhaus student) and watches from the 1950s. The Junghans Max Bill Chronoscope is, unlike the Rolex Explorer, not an outdoors watch, but a refined dress watch. Plexiglas protects the dial from scratches. The case is protected against splashes of water, but it is not suitable for swimming or diving. The movement has a timer and a date display, but no seconds hand. The chronograph's minute and hour counters are located at 12 and six o'clock. You can purchase a new Max Bill Chronoscope for around 1,400 euros. The IWC Portugieser offers a similar aesthetic. Since its release, it has developed into a reference point amongst dress watch chronographs. Its two subdials are arranged in a similar fashion to the Max Bill Chronoscope, although the subdial at six o'clock is not the hour counter but rather the small seconds. The Portugieser was first made in the 1930s when two Portuguese businessmen commissioned IWC to produce an extremely precise wristwatch chronograph. Today, the watch is one of the most famous watches in the world and its design is considered flawless. If you wish to give the Portugieser Chronograph as a gift, you should be prepared to spend around 5,000 euros on the steel version and twice as much on the gold version. If you want a watch with a more technical look, then IWC's Pilot's Chronograph is a good idea. Pilot's watches are designed for optimal legibility, as they should still be easy to read under poor light. Its dial was inspired by the look of an airplane's cockpit instruments, and the white numerals and markings create contrast with the black background. With a diameter of 43 mm, the IWC Pilot's Chronograph is relatively large and masculine, the perfect men's watch. The price for a new watch is around 4,500 euros. Flying is perhaps not the most common hobby, but you can profit from a pilot's watch and its features even if you're just a passenger. Dive watches also come in handy in situations beyond diving. Water getting into a case can sometimes be a death sentence for a watch. Even just turning the sink on and running water over your watch can add too much pressure for the seal. Most watches are waterproof to at least three bar, and drinking water pipelines usually have a pressure of between two and eight bar. You should probably refrain from swimming, diving off a springboard, kayaking, or other similar water activities with a normal wristwatch. He or she who actively participates in water sports would enjoy receiving a diving watch. Thanks to this type of watch's robust nature, it's also a good sport and outdoors watch. Like IWC, Breitling is mostly known for their pilot's watches. However, this Swiss manufacturer has also been a good representative of diving watches for decades. A good example of one of their crossover models is the Chronomat 44. It's waterproof to 500 m (50 bar) but is also a pilot's chronograph. The timepiece is powered by an automatic, in-house movement, Breitling 01. The caliber has an impressive power reserve of 70 hours. The Chronomat 44 is available with a stainless steel, bicolor steel and gold, or solid gold case. The price for a new Breitling Chronomat 44 starts at 5,500 euros. 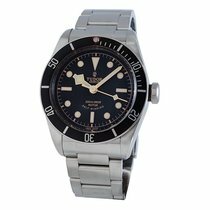 The Heritage Black Bay from Tudor, Rolex's subsidiary, is an excellent example of a dive watch. It's waterproof to 200 m (20 bar), which is the most common metric for diving watches. The Heritage Black Bay has a uniquely shaped hour hand, nicknamed the snowflake hand. The timepiece can be identified immediately by this distinctive feature. You can purchase a new Black Bay for around 2,500 euros. A Panerai watch also makes a good gift. The Panerai Luminor 1950 is a cult watch amongst dive watches. It has a 47-mm case, large Arabic numerals for 12, three, six, and nine, and a crown protector. A new Luminor usually costs around 6,500 euros. The Omega Speedmaster Racing is ideal for those with racing in their blood. The most well-known version of the Speedmaster series is the Professional version that accompanied the astronauts on the Moon. However, the watch, originally released in 1957, was not developed for space, but rather for the race track. The Racing has an integrated stopwatch, making it a chronograph. With its tachymeter scale, the wearer can determine average speeds per hour. The three subdials are arranged in a tricompax layout. The hour counter at six o'clock is somewhat smaller than the minute counter at three o'clock and the small seconds at nine o'clock. With a case diameter of 40 mm, the Speedmaster Racing fits well on almost any sized wrist. New, it costs around 3,000 euros. If you want to spend a little less money on your gift, then take a look at watches from Tissot. Tissot has had a close relationship with Omega since the 1920s. For only 500 euros, you can purchase a new sporty, quartz-powered PRS 516 chronograph. When powered by a mechanical automatic movement, a three-hand PRS 516 costs around 700 euros. The watch is a relatively affordable entry-level Swiss luxury watch. With an automatic chronograph movement, a new PRS 516 costs around 1,600 euros. Watches from Patek Philippe are on the complete opposite end of the price spectrum. The Nautilus first appeared in 1976 and was one of the first stainless steel sports watches. It was designed by Gérald Genta, who also designed the famous porthole look of Audemars Piguet's Royal Oak. A stainless steel Nautilus in very good condition costs around 30,000 euros. The rose gold version costs around 42,000 euros. The rose gold chronograph version sells for prices over 50,000 euros. Unlike Patek Philippe watches, good watches to choose as gifts when you're on a budget include those from Invicta, Citizen, Bulova, Movado, Casio, and Diesel. All of these brands are significantly more affordable than Swiss manufacturers such as Rolex or Patek Philippe. A watch from one of these companies is a good choice if you don't want to spend too much money but still want to gift a high-quality watch. Invicta has a wide selection of watches, ranging from their exclusive, youthful Disney collection to their professional Pro Diver series. An Invictus dive chronograph only costs around 110 euros pre-owned. Citizen, based in Japan, offers many quartz and Eco-Drive watches at lower prices. You can find Citizen watches, such as a pre-owned Eco-Drive chronograph, for as low as 240 euros. Bulova, an American company that was bought by Citizen, introduced the Precisionist, a new type of quartz watch, in 2010. It deviates no more than +/- 10 seconds a year and is very affordable pre-owned, at only 500 euros. Some Movado watches are more famous than others, such as the classic Museum watch with its distinctive, plain dial. The Museum watch is available in several designs at different prices, ranging from 200 to 700 euros. Movado was originally founded in Switzerland, but is now located in the United States. Casio is another popular manufacturer of more affordable watches. They are based in Tokyo, Japan. Casio watches are precise and powerful quartz watches. They produce both robust outdoor watches that can withstand water and rough conditions as well as sleek, classic dress watches. Their G-Shock watch can be purchased for as little as 200 euros. Diesel watches are the result of a collaboration between Diesel, an Italian clothing company, and Fossil, an American watch company. These fashionable quartz-powered timepieces cover a wide range of watches, such as chronographs and GMT watches, and cost between 100 and 350 euros.